Hey folks! I wanted to let you know that my nails are almost healed and back to normal. I am just raring to go with posting, I have literally hundreds of polishes to show you still! It has been lovely having a break and showcasing the talent of my fellow bloggers that I admire and aspire to be like, but I am ready to get back on my game :) I have a few more guest posts to go but then I'll be back. 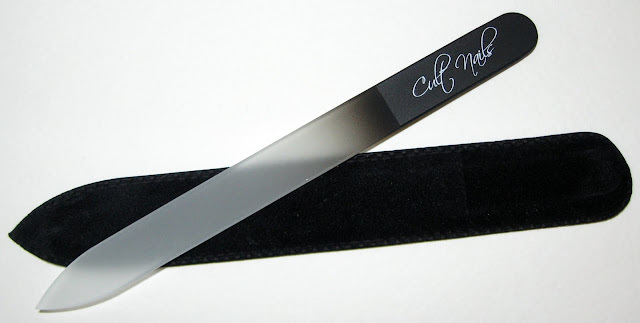 I wanted to write a quick review on my friend Maria's brand Cult Nails' nail files. I was recently privileged to meet her at CosmoProf in Las Vegas a few weeks ago and she graciously gifted me with one of her nail files that she sells from Cult Nails. It is a 5 1/2" double sided glass file with her brand name, either red or black, on the end. I love this file for several reasons, one - it is "sharper" or has a little bit more grit than most glass files I've used which makes it easier to file with and not so time consuming. Two - it is double sided, as most glass files I've used are only one sided. This increases its longevity as you don't wear it out as fast or it doesn't matter what angle you're filing from. Three - it's glass which is definitely more gentle on your nails, it is better for peeling or sensitive nails. And four - it comes with a velvet case to store it so you don't reach into your cup of tools and snag a nail on it by mistake (this happens to me with regular files all the time :P). You can get these from www.shop.cultnails.com for $10 $12 each. I think I've paid that much or more for any glass file I've gotten in the past so I think it's incredibly reasonable for the best one (in my opinion) ever. Toodles kittens! Product received as a gift.